It’s a worn-out fact that large portions of humanity have now achieved previously unfathomable heights of connectivity. Meeting people, communicating with them, and staying in touch requires essentially no effort when compared to not-so-distant times. The peculiar flip side of what at first appeared to be an unmitigated good is slowly revealing itself –you can’t add new gadgets to the interpersonal toolkit without profoundly changing the old ones. In this case, an entire generation of ultra-connected youth is bidding farewell to that quintessential human interaction: the farewell. I graduated a few months ago and immediately after commencement had to face an epic mass of goodbyes. I knew I’d see certain people again for various reasons, but the majority of those I’d known during college, I recognized, would disappear from my day-to-day life and leave only memories. Looking back on that last day of college, though, I realize that there was something very different about the way my generation says goodbye in comparison to the ways of previous generations. There were hugs and exclamations commemorating old times, but also remarks like “There’s always Facebook” or “You have my email address, right?” It almost seemed silly to make such a big deal out of physically parting when we knew the tools for real time information gathering and reconnecting were (and presumably will always be) at our fingertips. With popular social networking websites like Facebook, the traces of interpersonal decisionmaking bloom easily but never die – they are archived online and lurk at the periphery forever. There is no way to cut yourself off from the collective and wait for time to erase your mistakes from memory. Ink fades, synapses weaken, echoes disappear, but the digital cloud preserves. The collective secondhand experience of mass media and history has taught us that goodbyes are salient events – sometimes sad, sometimes relieved, but always remarkable for their finality. Human experience is fluid, not discrete, and so the abruptness of a serious goodbye is jarring. As a species we’ve realized this, and have developed complex cultural codes and rituals to recognize this artificiality and integrate it into normal life. From “Have a good summer!” to “Au revoir” to “안녕히 가세요” (”leave in peace”), traditional parting phrases take the strain off of the unnatural now and focus on an indeterminate future, real or hypothetical (but usually far off). By contrast, the language of online goodbyes is immediate, perfunctory, and often specifies a timeframe: “ttyl” (”talk to you later”) or “ttys” (”talk to you soon”) or even the stark “g2g” (”got to go”), which implies that the conversation is not truly over – just interrupted by life offline. Now, more than ever before, we are fulfilling the Sandelian concept of “the encumbered self,” which is one that is inescapably defined by its social, cultural, and historical context. In the days of the Wild West, it was possible to escape a dreary life in the cities of the American east coast and completely reinvent yourself by striking out for a frontier town where no one would recognize you. Today, the frontier has all but disappeared, and the ties that bind are not the ties that break. The extinction of “goodbye” has altered not only the ways in which we relate to other people, but also the ways in which we control and create our own identities. I am a communication addict. I ceaselessly maintain existing relationships and cultivate new ones. I constantly rely on the ability to interact with people through all kinds of media just to get me through the day. For me, this era is a gateway to unleashing vast human potential. Fully entering that gateway, however, requires enormous amounts of prudence, awareness, and flexibility. I am keenly conscious of the fact that every word I type in this article, once posted online, will comment upon and preserve my identity in a way that I can only control now, at the moment of creation. At the same time, even if I’m wary of the potential consequences of immortalizing this piece of myself, the increased contextuality I’ve gained through this self-scrutiny allows me to comprehend the similarly preserved bits of other identities I encounter. If the rules change for all of us, it’s illogical to acknowledge how they affect ourselves without also realizing that they affect others, too. The ultimate farewell is the farewell to isolationism and willful ignorance of the impact that I as an individual can have on others and that they can have on me. Before, the consequences of disregarding these effects were minimized in no small part by the finality of goodbye – the ability to distance yourself permanently from a situation without too much effort. That ability is gone, but in its place perhaps we can welcome a more informed, reflective social consciousness. It looks like “goodbye,” although weakened, still at least has the power to open new doors. I had a chance to interview Greg “IdrA” Fields on the Valor tournament, his Korean teammates’ reactions to foreigner tournaments, and thoughts on trends in the foreigner StarCraft scene. 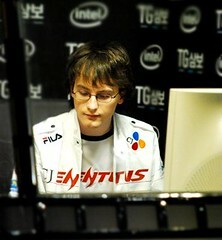 IdrA and I hung out a little last summer in Korea and later encountered each other again at WCG and BlizzCon last fall, so I’m always up for hearing what he has to say. Anyhow, take a look! Peanut: What’s your take on the Valor tournament so far? Was the ladder stage a walk in the park or were there times you weren’t sure if you’d make it out? Do you think you’ll be the one walking away with the top prize? IdrA: The ladder stage was pretty easy, there was never really a chance I wouldn’t qualify. I do expect to win, I feel I’m the best player here and we’re into the bo5/bo7 rounds so I definitely like my chances. P: Many of the players in the top 16 are familiar faces to you, especially recently since there have been a lot of international tournaments where you’ve placed very high up along with various combinations of these players. Are there any that stand out to you? Do you feel like tournaments help you get to know the other top foreigners as people or is your interaction pretty much limited to games? I: Well mondragon and ret stand out as the biggest names in the ro8, but mondragon hasn’t been very active lately. This tournament is actually kind of weird as there are alot of terrans left, which is very unusual for a non korean event. Our interaction is pretty much limited to games.